So I'm really glad Fashion Week(s) is over. This level of reporting (read: photoshopping) is too much for me these days. Back to the usual grind. But before I give style.com a break, let me quickly review the Fashion Giants. They all get one post because while they are not all of the same calibur in everyone's eyes, at least everyone knows them and either loves or hates them. You must be doing something right if you're loved or hated by the masses. ref: Russian royalty, goth ballerina, congrats to v (mel's sis) on styling! PS I can't address Miu Miu, I don't hate it but I am not sure what to say just yet. I would love to see what good stylists, editors do with the pieces. It could be a refreshing change... If you want to see it see here. Love McQueen, Galliano and Lanvin! And I do agree that LV references Anime. That and Blade Runner for some reason. I will go ahead and state that I don't like Miu Miu at all. Having seen the whole Miu Miu collection I don't think its as awful as I have thought, but I'm not warming to it either..
LOVE the lanvin. and he looks like an awesome cartoon character. 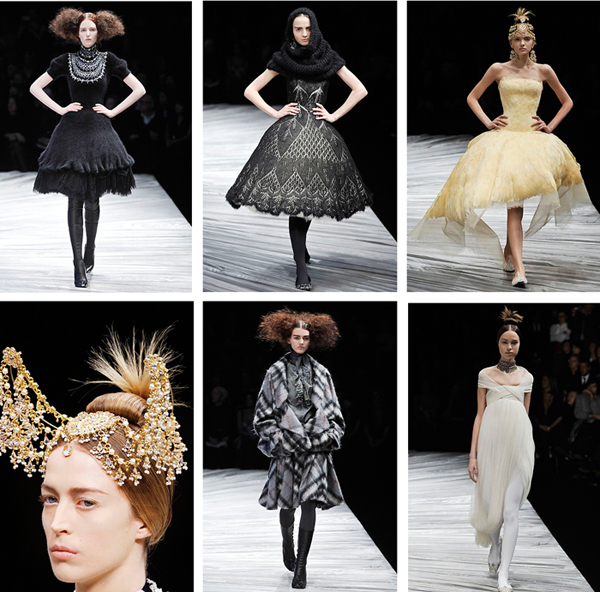 and i really enjoyed the shapes and surprises of the first mcqueen dresses. and for some reason, i really love when models walk with their hands on their waists.